That is an original “Steampunk“ style work. 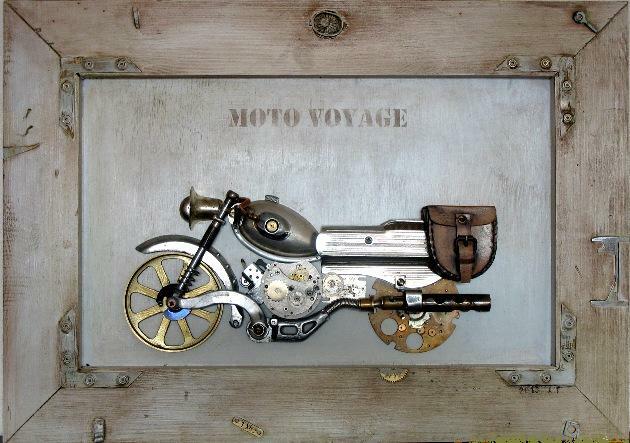 The parts of a “Singer“ sewing machine, the part of an old brass trumpet valve, the clock mechanism, a silver spoon, aluminum parts of a bicycle, a leather case of a compass and an old “Zipp“ lighter have been used to create it. Everything has been mounted with covered screws on a 5 mm plywood sheet. The frame has been aged with a lasur, fittings of old window frames have been used.